The Missus’s vomiting started out of nowhere. Well, not nowhere exactly — she had developed some spontaneous stomach issues a few years before, and so this had the smell of a recurrence. The symptoms quickly worsened, to the point where she was heaving up all the food in her belly a dozen times daily. Not even water would stay down. This was a severe episode, even by The Missus’s standards, so we scheduled an urgent appointment with our family doctor. Our urgency only got us an appointment next week, though, so for a few days we were on our own. We had just begun trying to conceive, but quickly ruled out morning sickness — that typically begins six weeks into a pregnancy, and The Missus’s last period had been just three weeks before. It was much more likely that The Missus’s nefarious stomach woes had returned. By the time the weekend arrived, it was clear that we could not wait the few extra days for our doctor’s appointment. The Missus had begun blacking out, was missing work, and spent hours each night on the bathroom floor. We resolved to head in to the walk-in clinic on Saturday. That just happened to be Valentine’s Day, as well the first day that a pregnancy test would provide accurate results. The Missus took the test, we waited for three minutes, and, well, we got some good news. If I tweet this with #clearblueconfirmed, when does my cheque arrive? We had both begun to suspect a pregnancy, as The Missus’s symptoms were slightly different than her previous vomiting episodes, but it was a different thing entirely to see the result. The rest of the day went pretty well — we went to the walk-in, where the doctor prescribed the typical morning sickness meds (Diclectin, if you’re curious). These helped immensely, though The Missus was still feeling depleted from the week’s worth of vomiting. We rescheduled our Valentine’s Day dinner plans and returned home to recuperate. Of course, I was still in good health, so I spent the evening on an impromptu Valentine’s Day gesture: bacon roses! Gather ye bacon rosebuds while ye may. That’s a pound of bacon rolled up and stuck onto fake rose stems. The result is quite striking. The closer you look, the more delicious it appears. Obviously, chocolate is the perfect complement to a pound of bacon. The Diclectin worked wonders, at first. Suddenly, The Missus could eat and food would actually stay down, which felt like a miracle after a week of constant vomiting. 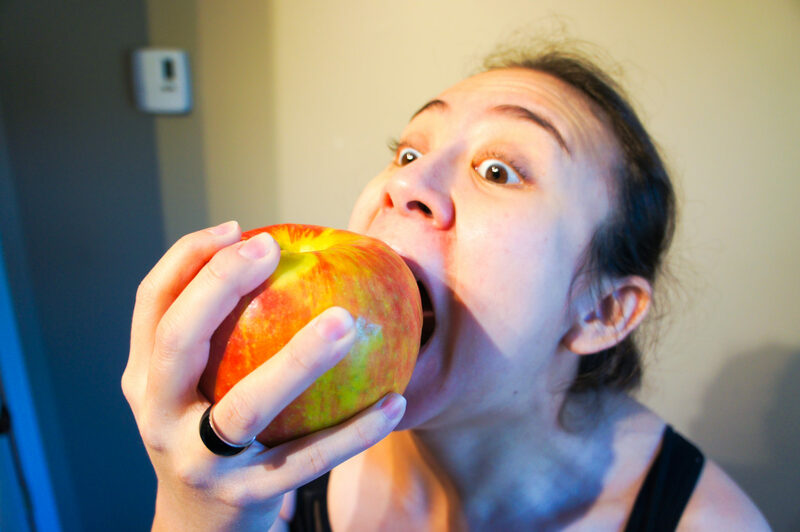 Unfortunately, the effects were temporary; over the following week, certain foods started triggering nausea. Chicken was one of the first, and every subsequent discovery limited The Missus’s options to a smaller and safer constellation of foodstuffs. Within 9 days, The Missus was restricted to only the safest foods. 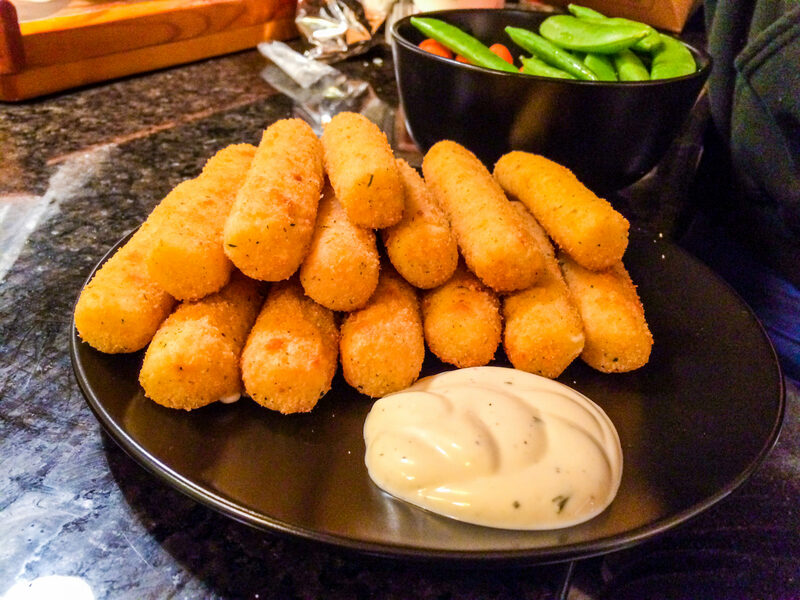 That is deep fried cheese with ranch dressing on the side. For dinner. The Missus’s symptoms didn’t stop there. As the days passed, her nausea got worse, to the degree that she started to feel nauseous even when walking across a room. You can probably imagine what travelling on the SkyTrain was like. 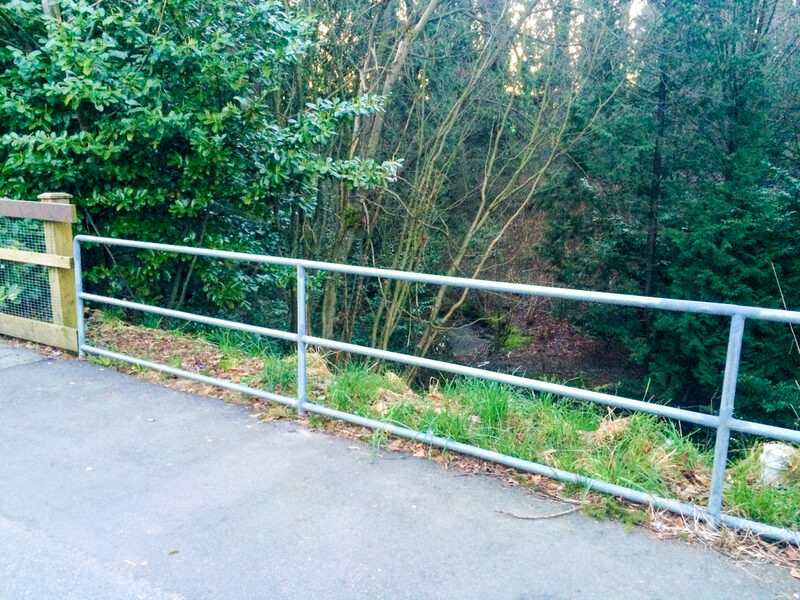 We got really familiar with this spot near our local SkyTrain station. As effective as the whole vomiting-in-the-bushes solution was, it wasn’t enough. The Missus’s symptoms kept worsening, to the point where not only could she not keep her water down, but also the Diclectin was coming back up. This redoubled the severity of her symptoms. This wasn’t helped by her sudden superpower — The Missus could smell the faintest odours from an uncanny distance, and all of them triggered nausea. Unable to work (or, at times, even walk), we took The Missus to our family doctor’s clinic. The doctor we met was sanguine — in his view, it was too risky to try any other medications, so it was best just to stop working/moving altogether. We explained that The Missus was a contract instructor, and so lacked anything resembling job security — missing a month would mean missing the semester and, potentially, never working at her school again. She needed alternatives. He shrugged and wrote a note excusing The Missus from work. If The Missus got dehydrated, he said, we should take her to the hospital for IV fluids. I was surprised at how quickly The Missus’s professional circumstances were discounted. We knew that other drugs are sometimes prescribed to pregnant women if their symptoms are severe, but apparently the complete surrender of her autonomy (and, potentially, career) was not sufficiently severe. We were at a loss for what to do. Within a few days, however, the path was set out for us — The Missus became severely dehydrated and, during a late-night vomiting session, blacked out on the bathroom floor. This seemed like the right time to take the doctor’s last-ditch advice and take The Missus to the hospital, so we made a bee-line to the nearest Emergency Room. We are so glad that we did. Although we would have preferred to avoid the six-hour wait in the ER (the lab lost The Missus’s paperwork, leaving her forgotten for a few hours ’till I could convince a nurse to check up on her tests), the result was worth it. The Missus was soon admitted, as an out-patient, to the antepartum clinic at Royal Columbian Hospital. I have a lot of significantly more miserable-looking photos from the hospital, but The Missus has veto power (and I am a fan of remaining alive). The antepartum clinic was a thing of beauty. In ER the beds overflowed, the seats overflowed, and the extra-capacity temporary seating overflowed. Late arrivals had to sit on the floor; the hospital was simply over capacity. In the antepartum clinic, however, there were three beds, two nurses, and one patient. There was a puffy armchair for waiting partners. There was peace and quiet. Every need was seen to immediately, roaming doctors came in when necessary, and the nurses were intimately familiar with The Missus’s ailment. The intensification of The Missus’s symptoms was quickly diagnosed as hyperemesis gravidarum, which is best described as “the bad kind of morning sickness.” There was even a newspaper clipping describing Princess Kate’s own struggles with the condition, reminding the clinic’s patients that they are not alone. After the earlier chaos and dysfunction, the antepartum clinic was an oasis of serenity and care in a chaotic and dysfunctional day. Before long, the nurses had put The Missus on an IV, gotten some fluids (and liquid Gravol) into her, and called in a doctor to prescribe pregnancy-safe amounts of Gravol to be taken at home. The theory, the nurses told us, was that the Gravol would help The Missus stop vomiting for just long enough to digest her Diclectin. The doctor also increased The Missus’s Diclectin dosage; apparently she had only been prescribed the typical dose, and not the maximum. 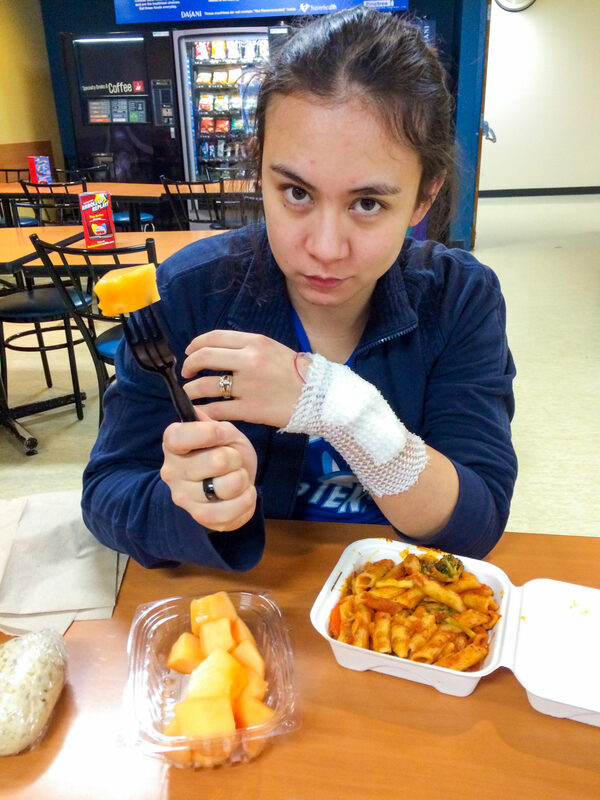 The treatment turned The Missus back into a food-devouring machine. We left the clinic after a long day at the hospital. The Missus was told to come back for the next few days for more fluids; being an outpatient, she could skip the ER, get her fluids, and leave. This was welcome news. 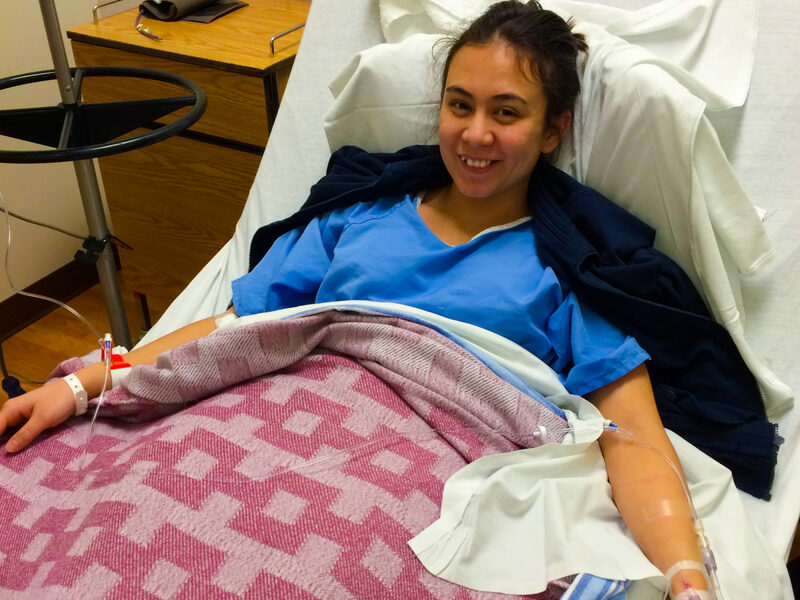 She still needed to spend most of her time in the hospital over the next few days, though, so she emailed in to work for a last-minute substitute (who ended up being the dean — The Missus’s college was in a boom cycle and so was short on teacher availability). Although the antepartum clinic doctor was confident in her diagnosis, she also wanted to check out The Missus‘s organs to make sure everything was working properly, just to be safe. Conveniently, this is done via ultrasound, so we could kill two birds with one stone — we booked two back-to-back ultrasounds for the 8th week of the pregnancy, one for the baby and one for The Missus. The antepartum clinic’s drugs did the trick, at first. For a few days, everything stayed down. The thing with hyperemesis gravidarum, though, is that its intensity varies — it’s hormonal, so a just-enough dosage today can quickly become a not-nearly-enough dosage tomorrow. By the time the ultrasound came around, just a few days later, The Missus could barely sit still without feeling dizzy and nauseous. The ultrasound went poorly. The Missus was supposed to drink four cups of water and keep it down for a while before the scan would work. This was challenging, but she managed to only retch up part of it. The Missus’s plight did not earn her much sympathy; the sonographer seemed vaguely irritated by The Missus’s heaving belly and snapped at her to keep still. It’s the little white blotch inside the larger black blotch. The Missus could only spot the screen from the corner of her vision, and she was only able to stay still for a moment before running for the bathroom, so she essentially missed out on the scan. The sonographer waited impatiently for The Missus to return; she asked what was taking so long, and I reminded her that her patient had hyperemesis gravidarum, which, you know, involves a lot of vomiting. Sometimes it takes time. While dealing with all of this nausea, The Missus found that some foods stayed down, while others didn’t. She stuck to the safe stuff, which occasionally involved impromptu trips to a nearby Chipotle (solely for corn chips) and a bakery (for pepperoni bites wrapped in cheese bread). 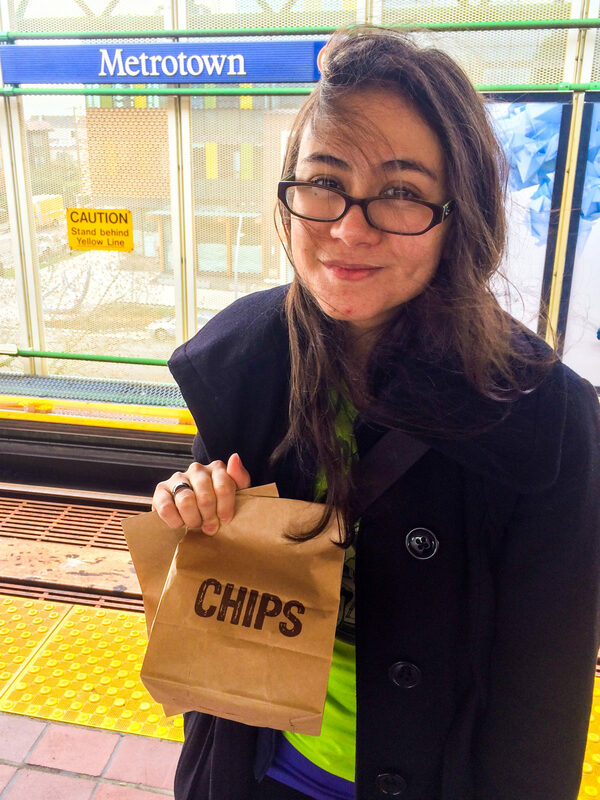 Luckily for her, there was a Chipotle on the ride home from the ultrasound clinic. Thankfully, this careful management worked better the second time around. The Missus would wake up late at night to take her Gravol so that she could take her Diclectin a half-hour later; that Diclectin would work its way through her system just in time for breakfast, which would stay down if it didn’t offend her senses. She took Diclectin thrice daily, hours in advance of each meal, and took the Gravol as-needed. Now, as it happens, The Missus is very sensitive to Gravol. Each dose would knock her out (or put her in a semi-drunken stupor) for a couple of hours. Afternoon Gravol time tended to overlap with class time, which meant that most days The Missus was skipping the Gravol in hopes that her body would cooperate (and, when it inevitably didn’t, adding several unscheduled breaks to run to the teacher’s washrooms for urgent business). Other days, when her stomach was especially unruly, it meant taking the Gravol just before the end of class and hoping that she could stay coherent for the last hour. This route had varying success. All of this finagling was worth it, though; food mostly stayed down and The Missus’s condition started to improve. We even managed to take a trip down to Seattle to visit our friends Shay and Mitch. Shay deduced The Missus’s delicate condition within minutes of our arrival — declining feta cheese on her dinner and asking whether the honey for her tea was pasteurized were dead giveaways. Notwithstanding Shay’s Sherlockery, we had a lovely weekend. 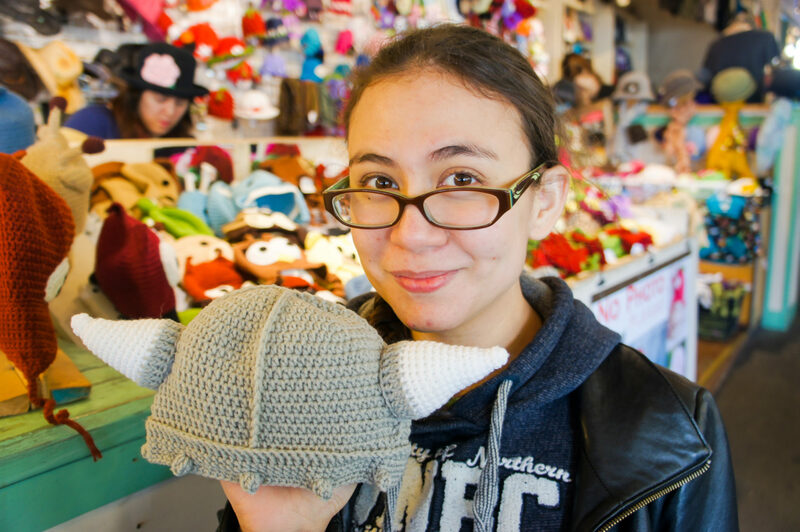 It included a tour of Pike Place Market, where we came across a stall selling baby headgear. Being baby-besotted, we had to buy one. We tried several (including the Viking hat pictured below), and eventually settled on a hat that looked like a frog. It’s sort of a thing in my family, don’t ask. If you squint, you can see the “NO PHOTOS” sign behind The Missus. We had a lovely time in Seattle. 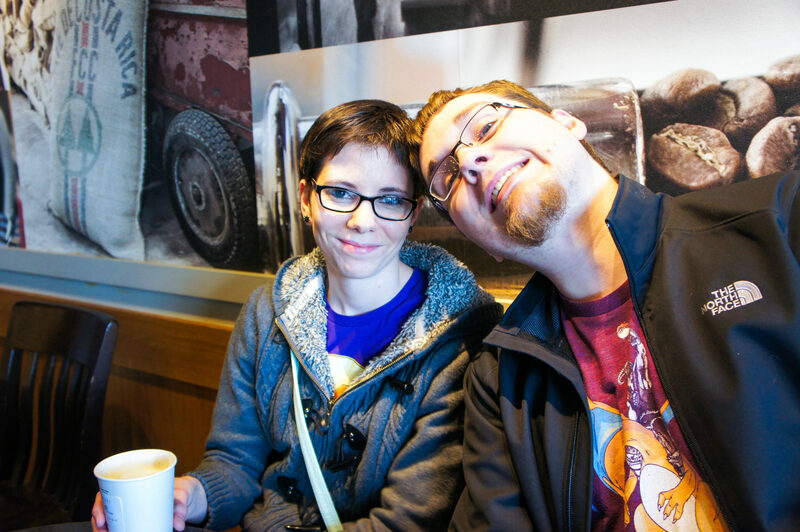 The Missus had toured the city before, but I’ve never really visited (I’ve only ever been there for PAX, which mostly involves wandering around the Convention Center and raiding the Cheesecake Factory). Shay gave us a guided tour, stretching from Pike Place Market to the Monorail to the Chihuly Gardens to the Seattle Public Library. No visit to Seattle is complete with Pike Place Market. Frankly, that garlic was mouse-sized at best. Amelia thought these restroom signs featuring a panicked-looking man were hilarious. Pike Place is nothing if not whimsical. This Chihuly fellow sure had a thing for glass. Amelia and Shay took a load off and stared at the grass-and-glass gardens. No joke: I will be incorporating these into my presentation on industrial designs. This is my space needle photo. There are many like it, but this one is mine. The Seattle Public Library took the whole “building of letters” thing to its logical conclusion. We visited during Holi, which gave us this striking scene near City Hall in Redmond. 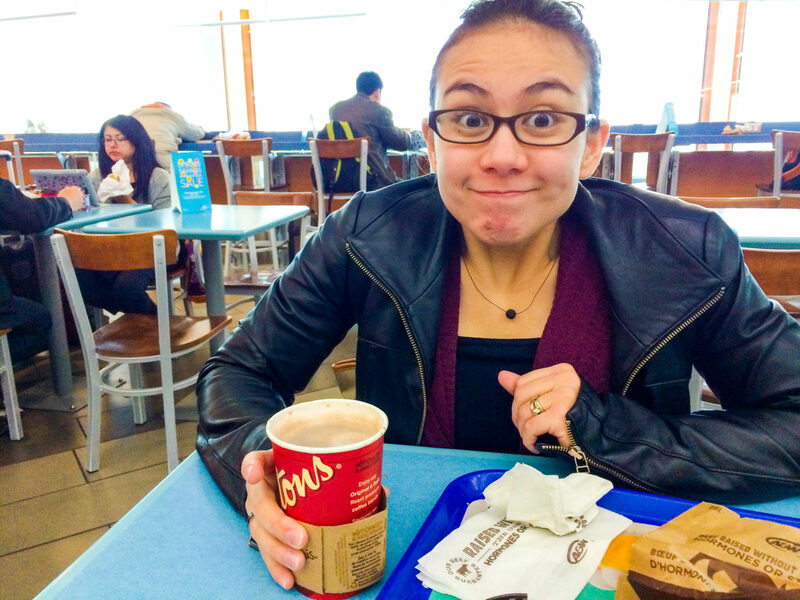 We returned to Vancouver in good spirits, though they didn’t last long. The Missus began backsliding; food wasn’t staying down, and (most concerningly) she had begun to lose weight. This is the opposite direction that one’s weight is supposed to go during pregnancy. 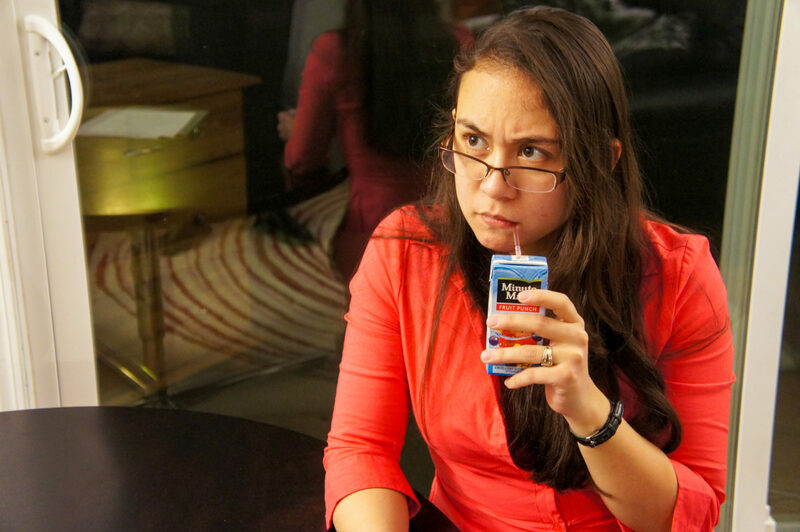 The shift was dramatic — within a few days, she was blacking out mid-vomit again. We had been warned that the tenth week of the pregnancy was often the toughest (for morning sickness, at least), and those prognostications turned out to be right on the money. We didn’t wait for The Missus to get dehydrated this time; we used her outpatient status to get her in to the antepartum clinic post haste. Whereas during the previous visit we had hemmed and hawed over whether The Missus would need to call in, this time we were quick to coordinate a substitute teacher. Though, in this case, “quick” means “with one day’s notice” rather than a few hours’ notice; once again, the dean stepped in to fill the gap. This was disheartening to The Missus, who was convinced that her second multi-day, short-notice absence would sink her chances at getting invited to teach at her college again. I suspected that she was right. She started openly contemplating abandoning the whole career thing, rather than starting at the bottom in another job without benefits or security while also caring for a newborn. Fortunately, fantastically, that very same day The Missus got good news — her college wanted her back for the summer. Her dean (the very same dean who was sacrificing evenings with his children to teach The Missus’s classes) understood the heavy toll of pregnancy and didn’t hold her absences against her. This was, frankly, more than we expected. It wasn’t just employment that was tilting in The Missus’s favour; the clinic’s doctor prescribed even more medication (Maxaran, this time) to help with the vomiting. This stuff worked like a charm, and was considered by the doctor to be fairly safe for pregnancy — safer than not being able to eat or drink, at any rate. After getting a few more holes poked in her arms and getting topped up with some more fluids and drugs, The Missus was ready to head home. The Missus continued to be buffeted by intense nausea symptoms for the next week, but the Maxaran helped keep it under control. And then, one day, those symptoms all but disappeared. 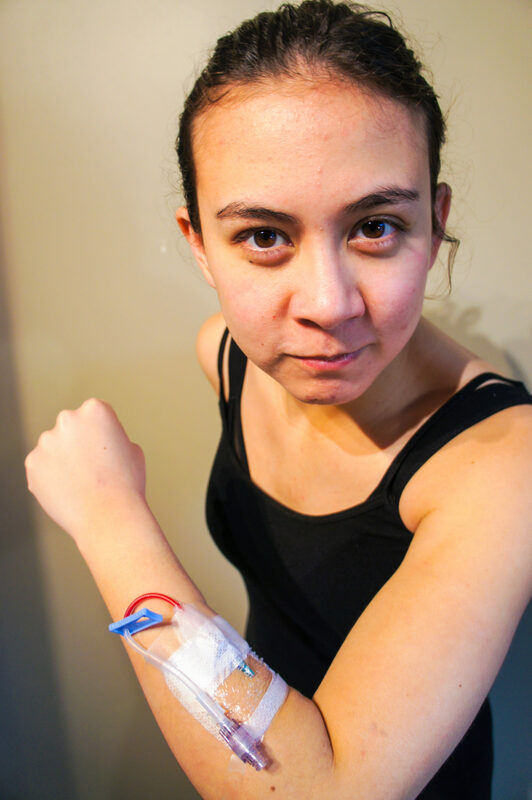 Regular doses of Diclectin kept her relatively mild, residual nausea at bay, but the Maxaran and Gravol got shelved. The Missus‘s doctor explained it thusly: morning sickness is caused by hormones released by the yolk sac that the embryo/fetus feeds on for the bulk of the first trimester. As the yolk shrivels up, those hormones decline. This happens quite suddenly, so one day you’re vomiting at the mere thought of food, and the next you’re an insatiable eating machine. Pregnancy is a heck of a ride. The Missus started to feel better just in time for Easter weekend. We had originally planned to travel up to Prince George to announce the pregnancy to family and friends over the long weekend, but we were stymied; my father and stepmother were visiting Vancouver with friends, so we pushed our trip back to the next weekend. Now, you might think that we could just tell them while they’re in town and tell the rest of the family on the next weekend. You would be wrong. Although my stepmom, Susan, could be trusted to maintain secrecy, my father could not. He is very, very excited to be a grandfather — his grand-paternal aspirations even featured on his LinkedIn profile. Further, as you can likely tell from this very blog, the impulse towards personal privacy is not a strong one in my family. In no universe is it conceivable that my father could keep confidential a secret of such magnitude for seven consecutive days. So, instead, we spent an afternoon with my father and stepmother on Granville Island, carrying with us our precious cargo and tantalizing secret. Also, occasionally, blueberry tarts — though these were much easier to carry. We just had to make it through the week. The following week The Missus had her 12-week checkup with our family doctor. This was an especially important appointment — 12 weeks marks the end of the first trimester, which is when the vast majority of miscarriages happen. Depending on how you count, something like 15-30% of pregnancies end in miscarriage. We’re told that most of these are due to chromosomal abnormalities — that is, most miscarriages are embryos (or fetuses) that could never have become viable babies. Which is reassuring (it’s not your fault if it happens) and terrifying (there’s little you can do to prevent it). Our strategy for dealing with the potential of miscarriage was to treat the pregnancy as conditional until the 12-week mark. This required open communication, which meant reviewing miscarriage statistics before trying to conceive and discussing the topic frequently after the positive test result. Although it’s a dour thing to live with the anxiety of potential miscarriage, I think it would be so much worse to not steel yourself for it and then be surprised by the loss of the baby that you were convinced you had. So we had spent the first trimester doing emotional gymnastics — counterbalancing our excitement for the baby-to-be with reminders that the pregnancy isn’t really, truly confirmed until week 12. This appointment was where we found out whether the fetus had made it through the hazardous first trimester. In a practical sense, it’s when we found out whether The Missus was truly pregnant. 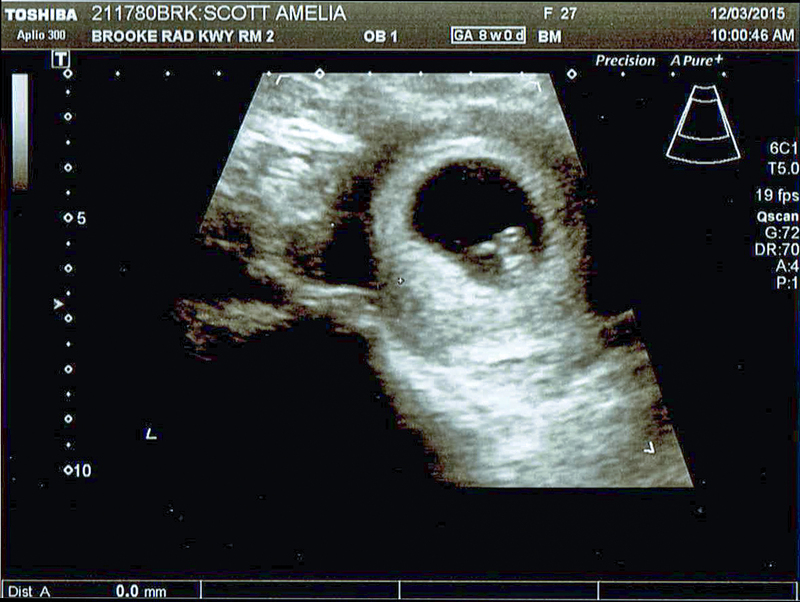 As you’ve probably guessed, the doctor confirmed that the fetus was alive and well. The Missus got to hear the fetus’ little heart ticking along healthily at 160 BPM. This meant that we could announce the pregnancy to the world, which we planned to do that weekend. Of course, any decent pregnancy announcement needs cute photos. The Missus and I had brainstormed some ideas during the early part of the pregnancy, but I did not care for the hurried photos I’d taken one weekend. I mentioned my dissatisfaction to my brother, David, who volunteered to come over the night before we left to stage a photo shoot. The results were much improved. 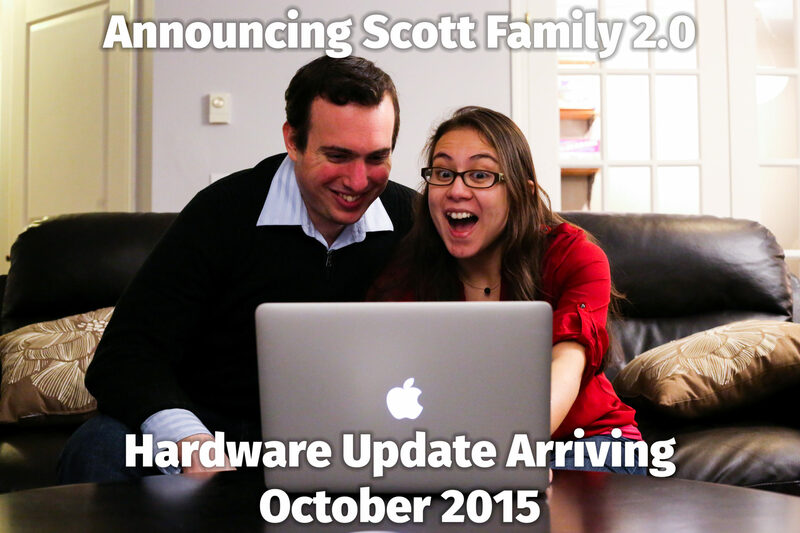 My first idea involved a joke about software development that The Missus morphed into a “hardware update” gag. The original plan was for both of us to be working on laptops in a dark room, with an iPhone in a bassinet between us on the couch. The problems were that (a) the photo was super dark and (b) we did not have a bassinet. David simplified the shtick, and I think it works better this way. It’s better when you can see our faces. The Missus’s idea was to do a multi-shot series involving video games. I liked the video games angle as well — we were both in favour of announcements that reflected our hobbies and personalities. We settled on a shtick involving the text “loading player 3” superimposed over us waiting with gamepads (early mockups involved a loading bar, but I nixed it). Although we thought that up on our own, it turns out that similarly-minded expectant couples have done essentially the same thing before. I guess we’re in good company! We had to hunt for a kid-appropriate multiplayer game. Amelia really gets into the competitive spirit. For balance, I had to have a brief moment of victory. Amelia totally pwns me. I call hax! Notice how the controller above us has lit up? It’s the little touches that matter. Our favourite idea wasn’t even our own, but it was perfect. 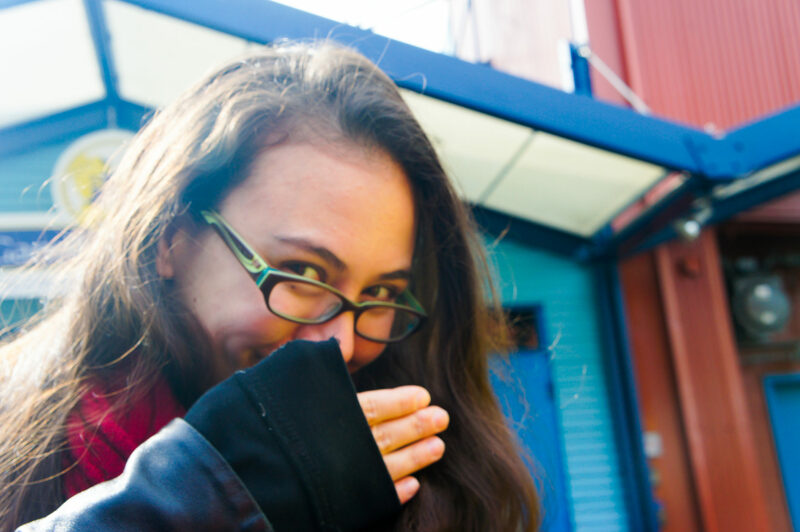 Our friend Lauren, mere seconds after hearing our ideas for the announcement, suggested that I mock-sue The Missus for copyright infringement (i.e. 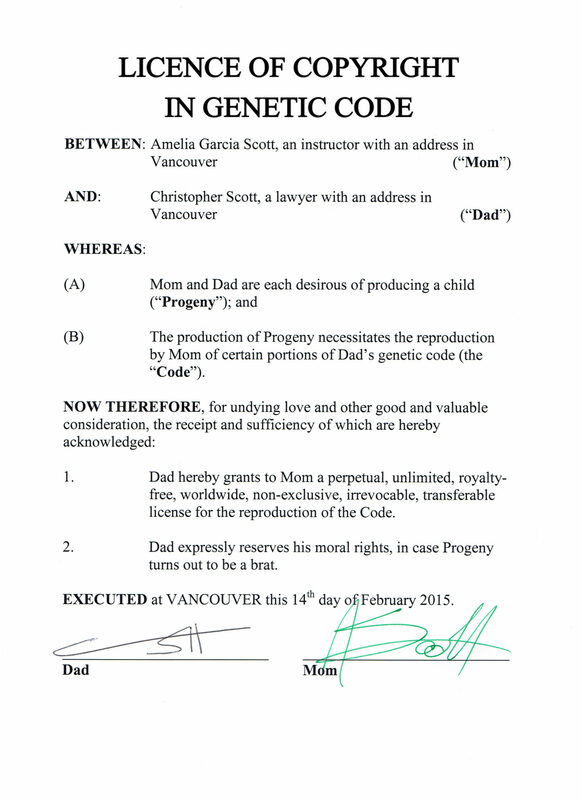 for copying my genetic code). This idea was genius, though we varied it a little; instead of filing suit (which is hard to convey in photos), I prepared a copyright licence agreement. We even staged a little signing ceremony. I also prepared a Notice of Civil Claim (the document that gets served on someone you’re suing to start a lawsuit), but at 10 pages long it sort of lost its comedic punch. Still, just in case, we also staged photos of me serving The Missus with the papers. She is a serious lady. Finally, with photos taken, fetal health confirmed, semester ended, and tickets purchased, we were ready to fly up to Prince George and tell our family and hometown friends. The first trimester had been harrowing, and as it began to draw to a close we were ready to celebrate. This is the face of a woman who just kicked her morning sickness. There is no greater happiness. We arrived at the airport and took a taxi straight to my mom’s workplace. She would be the first to find out, and we had the perfect announcement planned for her. We’d bought a mug (she’s a coffee fiend) emblazoned with numerous positive attributes (beautiful, feisty, joyful, etc.) and, right in the middle, the word “grandma” in big text. Notice the frog in the background. It’s a family thing. You might be thinking “well, that seems pretty straightforward.” But it just so happens that this reveal was a bit of a slow burn, because my mom’s vision is nearly non-existent. 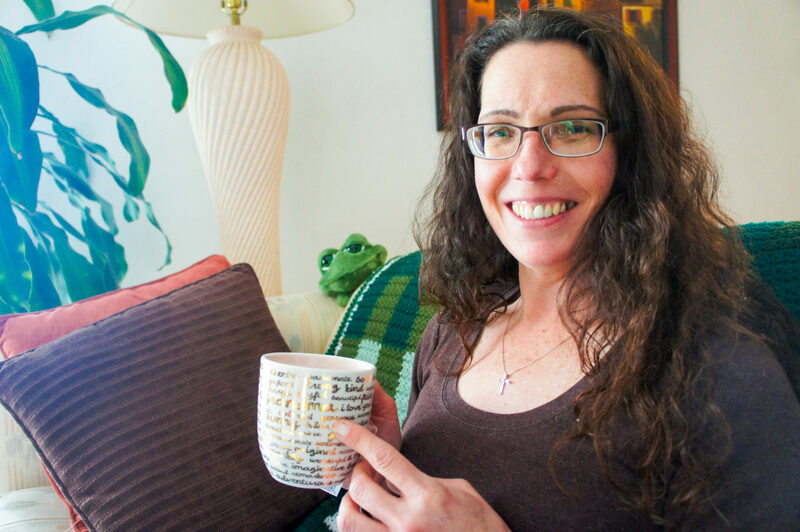 She had to work her way half-way down the mug, word by word, before coming across her new title. The tedium of this task only made her realization sweeter. After revealing the pregnancy to my mom, we met up with The Missus’s mom to give her the good news over lunch. My mom got invited to lunch as well, so she got to be on the other side of the reveal. My mom does not have much of a poker face; she was dropping little hints from the moment we sat down. Fortunately, The Missus’s mom is nearly as hard-of-hearing as my mom is vision-impaired, so her lack of subtlety didn’t get picked up. The Missus had purchased a card for her mother, which is their Easter tradition. Much like with the mug, however, this card said “Grandma” in big letters across the top. The letters were Easter-themed and looked like blades of grass, so we hoped it would take he a second to decipher, leading to a moment of confusion followed by sudden clarity. 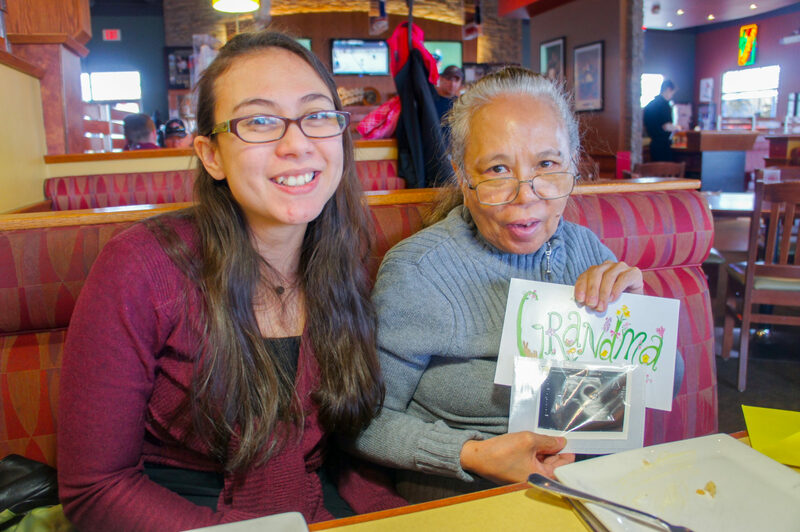 She liked the news even more than she likes Boston Pizza’s lunch specials, which is saying a lot. Next on our list was my dad, but — in a frustrating twist of fate — he had been called out of town on business, and would be arriving home in the evening only to leave for another event. We were beginning to worry that we wouldn’t have a chance to meet up with my dad and my stepmom before the following day, at which point word might have begun to leak out. They know practically everyone in our hometown; once one person knew, they would be sure to know before long. I phoned my stepmom, Susan, for her help in subtly encouraging my dad to stop by at home for a few minutes before dinner. Susan tends to be the more practical of the two, which jives with my own deadpan demeanour, so I gave it to her straight — I opened with something along the lines of “Hello Susan. The Missus and I are in town to announce that she’s pregnant.” I figured she’d appreciate the directness. Susan pulled through and got my dad to stop by his home for a few minutes, where we dropped the news (this time with a “#1 Grandpa” mug — he loves mugs). Not pictured: the millions of bacteria coursing through his body at that moment (he was quite ill). Although we’d expected my dad’s reaction to be the strongest among the parents (he really, really, really wants grandkids), it turned out to be somewhat muted. Despite our attempts at subtlety, he had deduced that our short-weekend trip and insistence on seeing him could only mean one of two things: a death or a pregnancy. 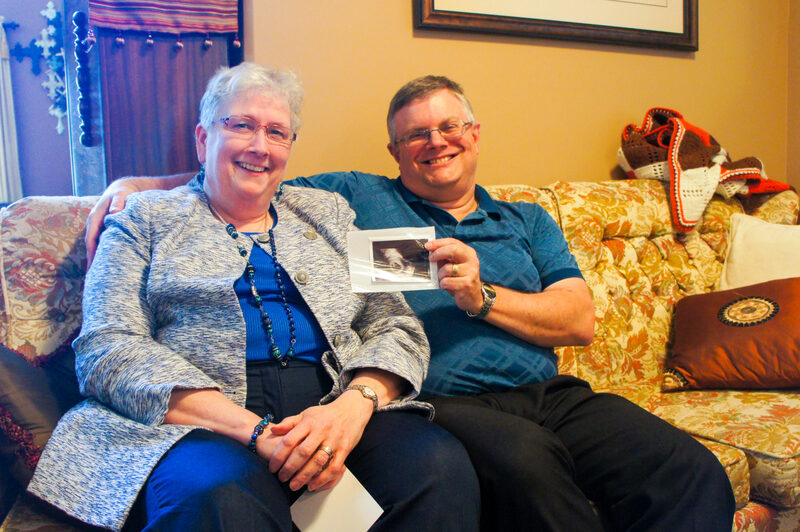 He was guessing that it was the latter, so our announcement was greeted with mild relief and even milder surprise. As with the other announcements, I recorded his reaction. In retrospect, he’s a little embarrassed about his tepid response, but in his defence he was ill, tired, and too clever for his own good. We don’t hold it against him, but we will tease him about it for decades to come. Shaundra and Jessica in their pre-announcement bliss. Brian talks while Shawn contemplates his next speed run. Aisha, on the verge of tears, post-announcement. This little joker tried to photobomb my photos. It worked. Shawn and Shaundra post-announcement. Cool as cucumbers, those two. The rest of the day was a whirlwind that went mostly undocumented. Our last stop of the day before flying back was at a Starbucks, where two very important things happened: an excitable barista taught The Missus about the glory of the peach tea latte with no water and extra vanilla bean (her new favourite drink) and we got to tell our friends the Whitwicks about the pregnancy. And, with that, we flew back home to Vancouver. Now that the worst symptoms of the first trimester had passed, we were looking forward to a relatively comfortable second trimester. The first trimester had been more than difficult — it had been harrowing, and it had at various times promised to discard The Missus‘s personal autonomy, career aspirations, and personal health. When people asked me how the pregnancy was going, I would tell them the truth: so far, it had been terrible. We were eager to be able to start giving a different answer. Of course, none of this is the baby-to-be’s fault; we’re the ones who chose to start a pregnancy, not it. The medical challenges of that process will not lead us to love it any less — if anything, it’s a testament to what The Missus is willing to do for this little one, even before it is born. Notwithstanding the horrors of the first trimester, she would do it again (though maybe with more Diclectin at the get-go). If that isn’t love, I don’t know what is. The Missus doesn’t just love our baby-to-be, though. She also loves eating. With the second trimester on the horizon, she hoped to do a whole lot of that. My wife is an ambitious woman. So far, the second trimester has been everything that we’d hoped for — as many women will attest, it is the best trimester. We’ve gone on vacation (a babymoon in Hawaii! ), The Missus has been back to work at a school she loves, and we’ve managed to spend our weekends at home instead of at the hospital. But that’s a story for the next post. For now, just know that The Missus’s healthy, we’re both excited, and we can’t wait for what’s next. 22 May 2015 11 February 2018 Christopher ScottComments are off for this post.